When Bumble launched in 2014, it hailed itself as a new kind of dating app that gave women control over their romantic destinies. Now, it's asserting that power and removing users who don't treat women like the queens they are. Last week, the company said it was blocking a user named Connor after being alerted to his rant against a female user. "Dear Connor, It has been brought to our attention that you lost your cool on one of our female users named Ashley," reads a blog post on Bumble titled "An Open Letter to Connor." The interaction between Ashley and Connor started innocently enough: "How's it going," she asked him. He replied: "Great, thanks and yourself?" But things spiraled quickly when Ashley asked what he did for a living. Connor -- who claimed to have a $300,000 job and a Notre Dame finance degree -- proceeded to berate Ashley, who he presumed had a $40,000 account manager job. 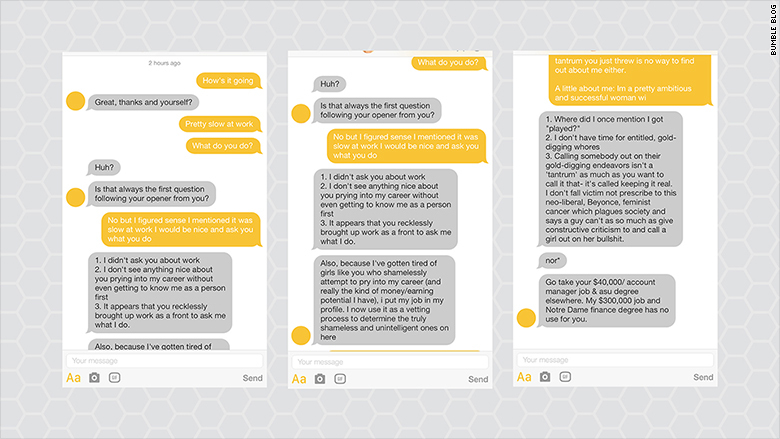 "I don't see anything nice about you prying into my career without even getting to know me as a person first," he wrote in screenshots obtained by Bumble and posted on its blog. "I've gotten tired of girls like you who shamelessly attempt to pry into my career (and really the kind of money/earning potential I have)," he wrote. "I don't have time for entitled, gold-digging whores." And surprise! Things got even uglier: "I don't ... prescribe to this neo-liberal, Beyonce, feminist cancer which plagues society and says a guy can't as so much as give constructive criticism to and call a girl out on her bullsh*t," he wrote. Bumble took the opportunity to school Connor on why his reaction was inappropriate and, moreover, why he doesn't belong in its community. "We can gather that she wasn't hoping to figure out if your wallet was sizable enough for her to move into your house and start cooking dinner for you after vacuuming your living room while you clock in a 9 to 5 work day," Bumble wrote. "It might sound crazy, but people connect over the basic routines of life. You know ... the weather, working out, grabbing a drink, and working." Bumble, launched by Tinder cofounder Whitney Wolfe, follows a similar premise as Tinder. People swipe for matches and photos are prominent. Unlike Tinder, Bumble requires women to initiate conversations once a match is made. "We hope that the hate and resentment welling up inside of you will subside and you'll be able to engage in everyday conversations with women without being cowardice to their power ... We are going to continue to build a world that makes small-minded, misogynist boys like you feel outdated." Bumble signed off its blog post with the hashtags #ImWithAshley and #LaterConnor. Support has been pouring in on Twitter. #imwithashley because asking what somebody does is basic small talk. #LaterConnor for thinking it was a gold digging technique. Bumble did not immediately respond to request for comment.